With Gran Turismo 5 due out on November 24 (knock on wood… then find a rabbits foot and knock on more wood), the advertising that has been waiting in the wings can finally be unleashed on the hordes of eager fans. 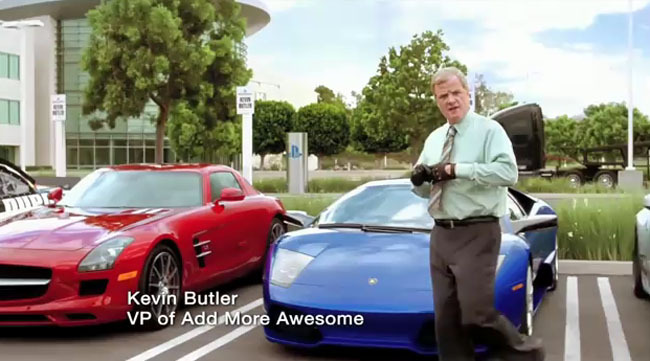 Enter Kevin Butler, Sony’s VP of whatever is funniest at the moment, who returns to the airwaves to discuss GT5 in all its glory. He then steals a car. Long live Kevin Butler! After one or two delays that you may have heard about, Gran Turismo 5 is finally going to be released. In theory. Sure, the game is said to have already shipped to retailers, but until the game is in our consoles, and you have played several hours, anything can happen. Check out the trailer below and get ready to FINALLY play GT5 next week exclusively for the PlayStation 3.